These are the words I say to myself when I am riding especially fast. Or especially slowly, as of late. 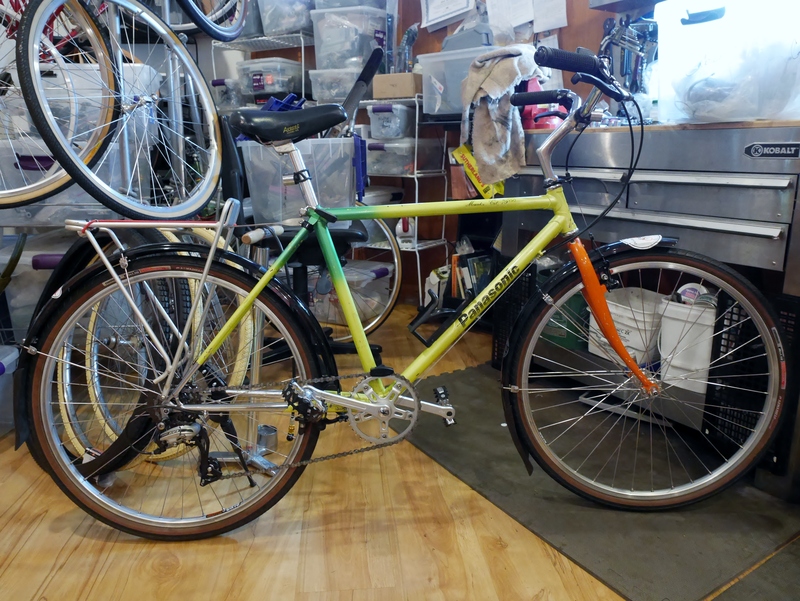 This winter I have been using my Panasonic MC 7500 winter bike as my primary commuter, which is a change from past winters, partly driven by this winter’s wet and colder conditions which heralded the onset of a typically Portland rainy season last November. Very recent winters have been gloriously warm and dry, so my choice of commuting vehicles was vastly expanded and even included scooter rides in the dead of December. But, not this winter. Portland is back to typical seasonal weather which can include anything from 35 degrees and raining hard, to light sprinkles in the lower 50’s (like today), and the occasional freezing rain and snow. The short days also come with twilight seeming to descend in apocalyptic fashion in the middle of the afternoon. 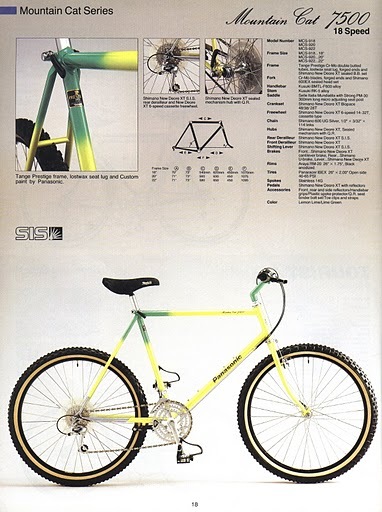 This bike was actually quite the machine in its day – the top of the line Mountain Bike in Panasonic’s line up in 1987. 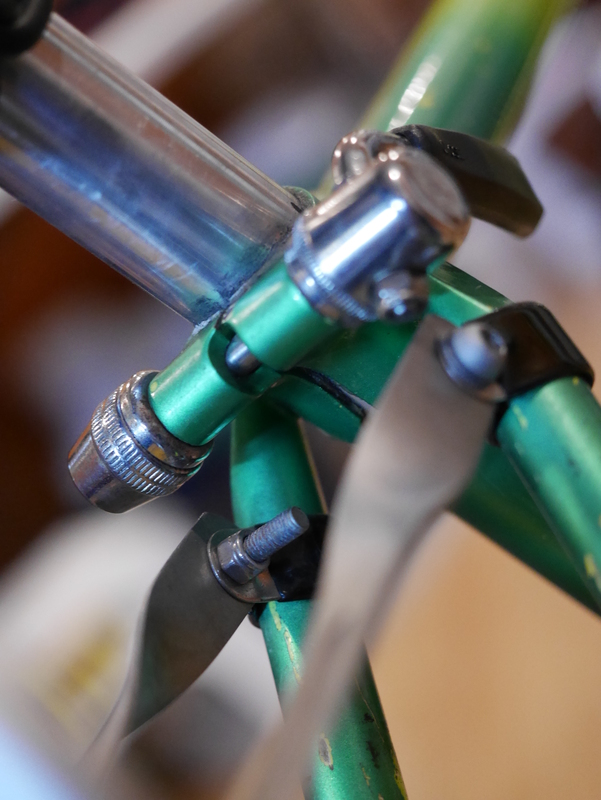 It is built with Tange Prestige Cro-Mo double butted tubes, with forged drop outs and chromed chain stays. The geometry on the smaller frame that I am riding features a slack 70 degree head tube combined with minimal fork rake, which would normally make it less than ideal for commuting, but its long wheelbase (107 cm) makes up for the higher than ideal wheel flop. Consequently, I can usually avoid putting my foot down as I approach red lights and four way stops. 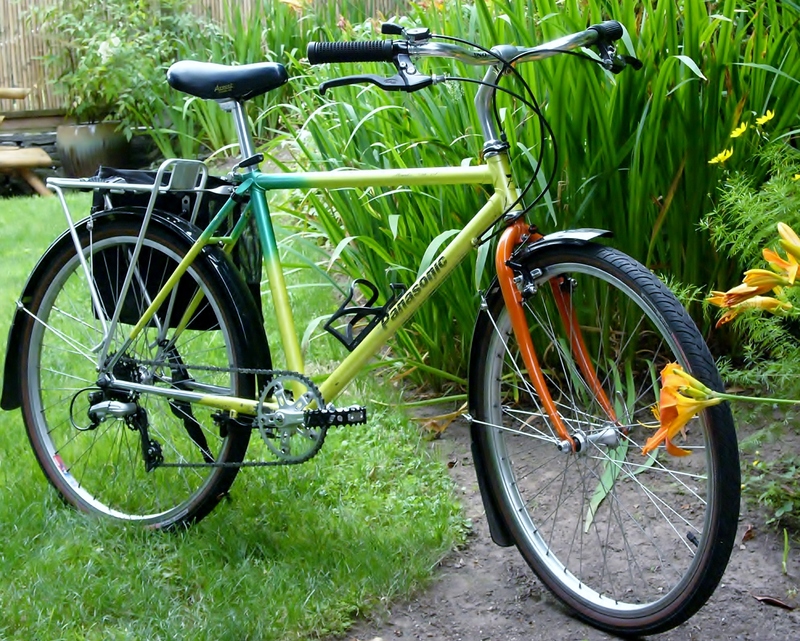 I bought this Panasonic as a frame and fork, then built it into a city commuter. It went through various iterations, and now is set up for maximum comfort and utility. 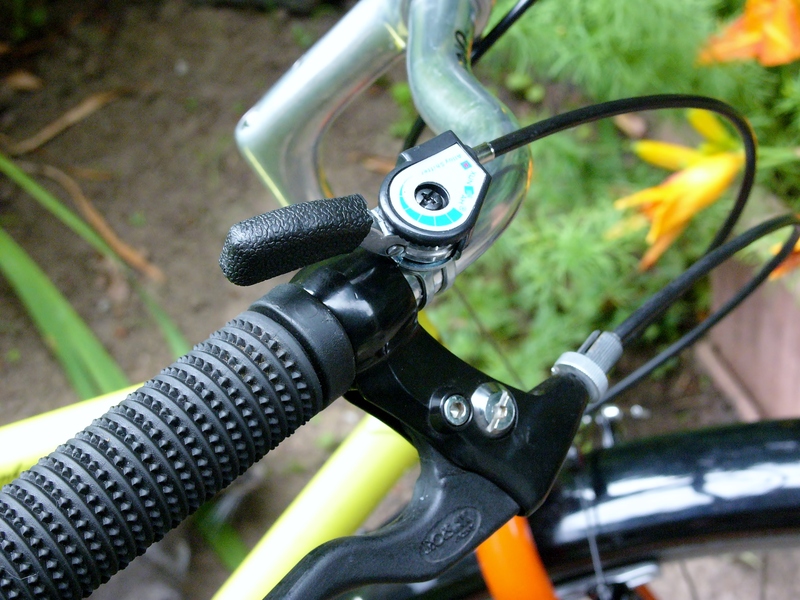 I was using a Shimano grip shifter and a 6 speed cassette, but after a black ice crash in 2012, the shifter broke apart (because it is made of plastic), so I splurged on a $7 no name friction shifter, made of good old steel. 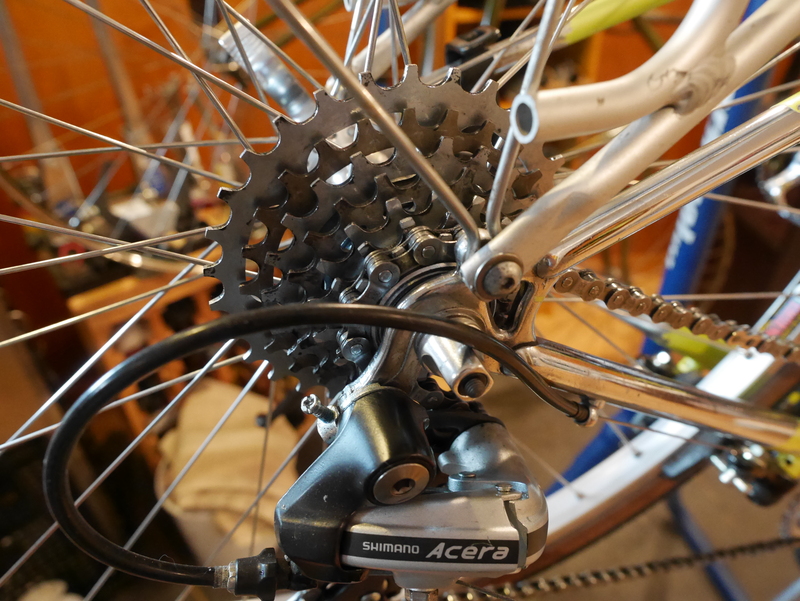 That meant that I could install a 7 speed freewheel, and increase the bike’s gear range a bit. 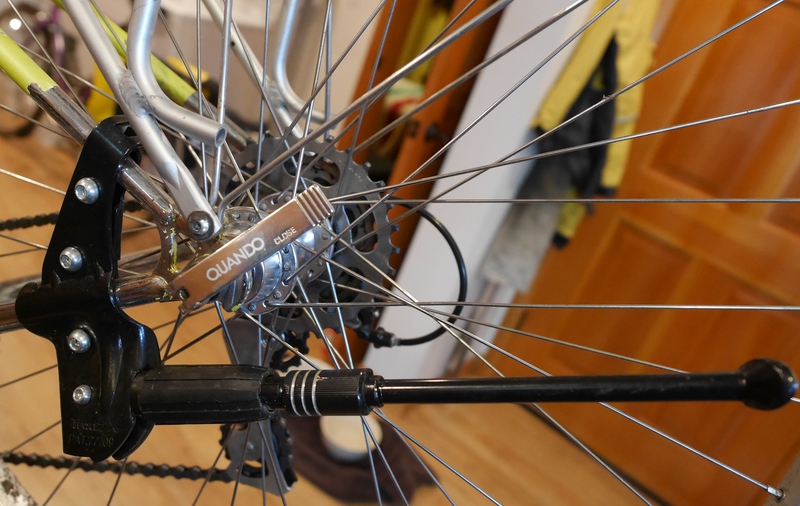 I had been using these UNO city bars, pictured above, but the shape and width did not agree with my anatomy, so I swapped them out for a vintage steel Northroad bar. 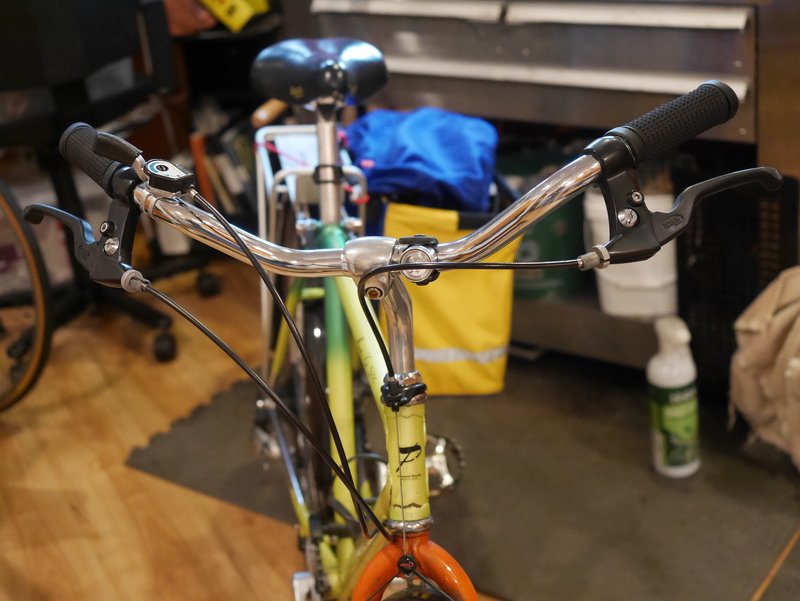 This bar is a great improvement in comfort, being narrower and putting my hands and shoulders in a much more neutral position, and increases the bike’s un-coolness factor by a few thousand degrees. 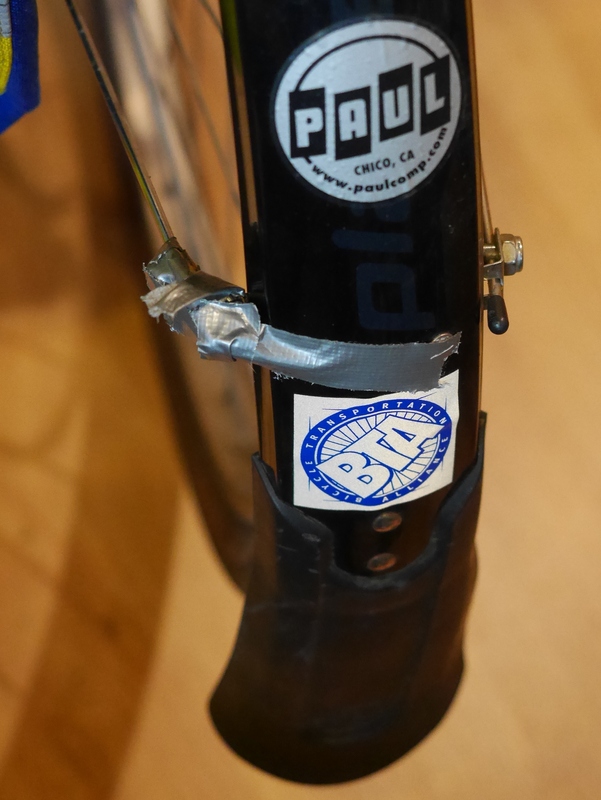 Further agitating bike snobs in Pdx, the Panasonic is sporting a duct tape rear fender repair job, and a ghastly kickstand. 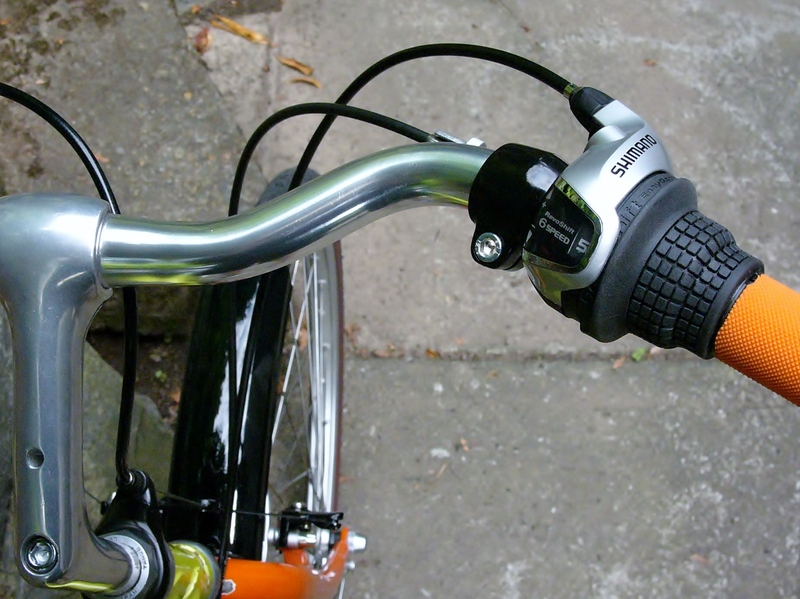 The kickstand is a convenient accessory, and this design is useful for any bike where mounting in back of the bottom bracket is not an option (in this case due to the U-brakes residing there). 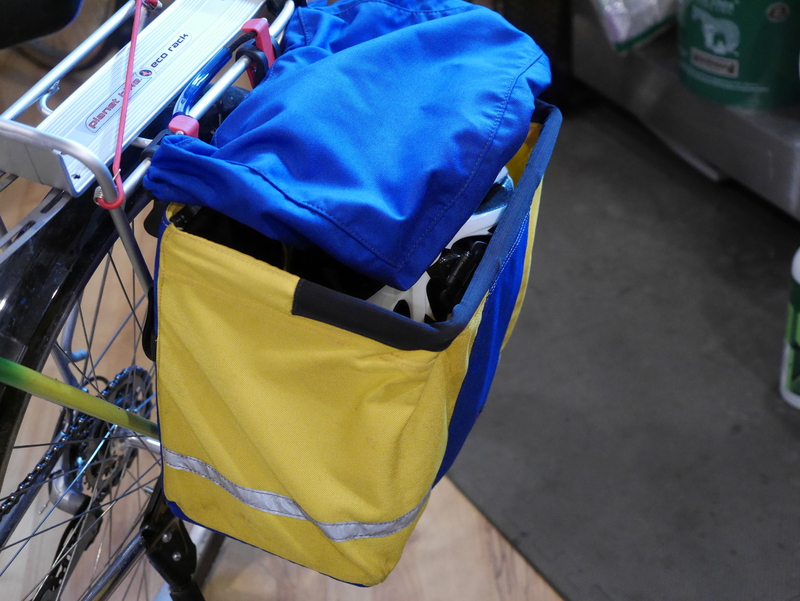 The stand is adjustable to any wheel size, and keeps the bike secure, even when I have my bags loaded up with groceries. I like using these Jandd Hurricane bags, which are aptly named and can handle just about any kind of weather. 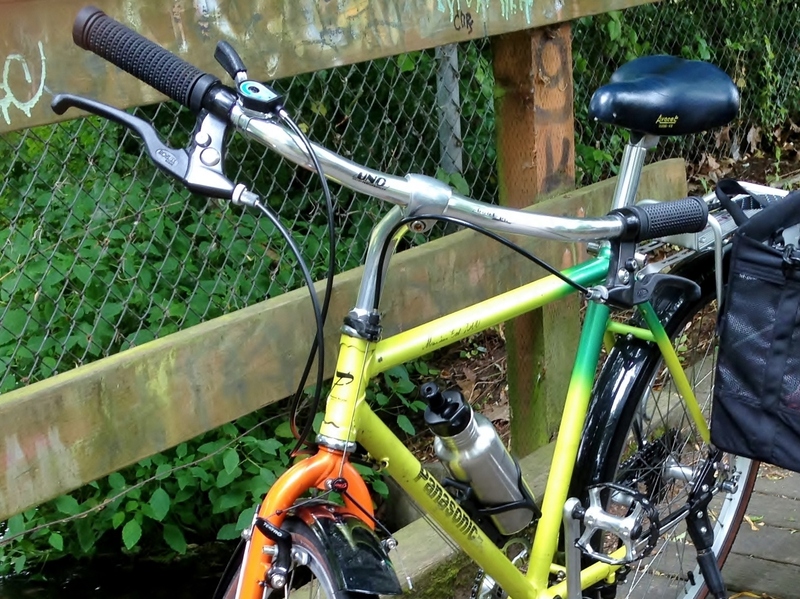 Their vibrant colors augment my winter bike’s 1980’s color scheme, and add a lot to its visibility. If you haven’t used Jandd bags, you are missing out on the ultimate in practicality and quality. I have a set of Jandd panniers that are 30 years old, and still look new. 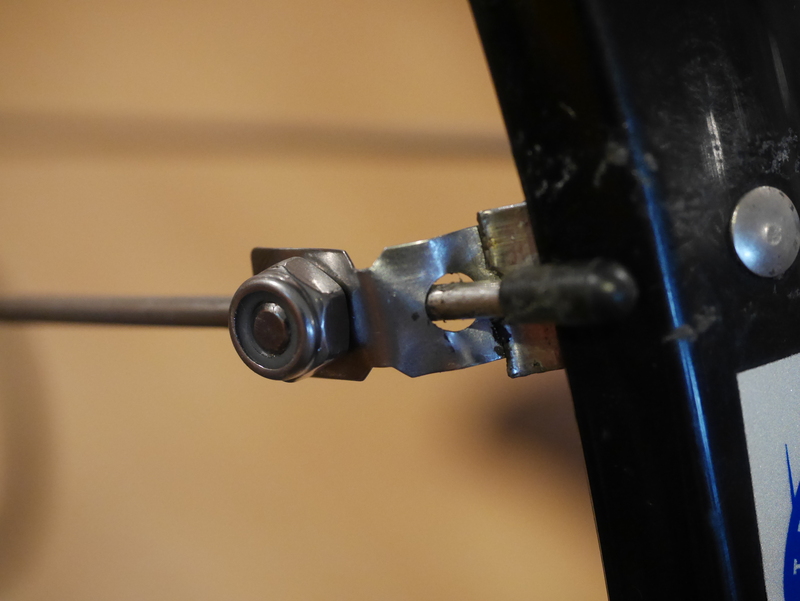 The Panasonic MC 7500 is a bike that enthusiasts have embraced, but the frame does have its downsides – one of them being that on some builds, holes drilled in the seat stays (necessary to allow heat to escape while brazing), were actually drilled very close to the seat stay attachment. 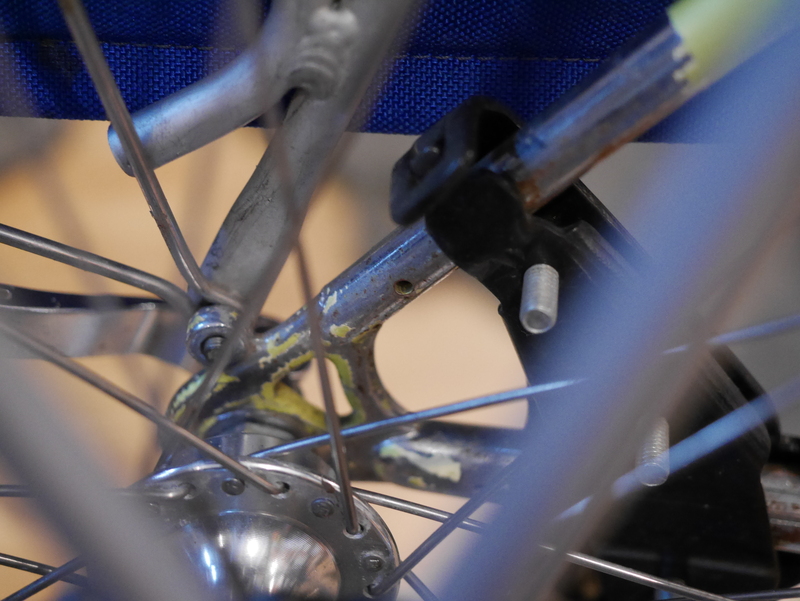 Fortunately, on my frame, the holes have been drilled near the dropouts. 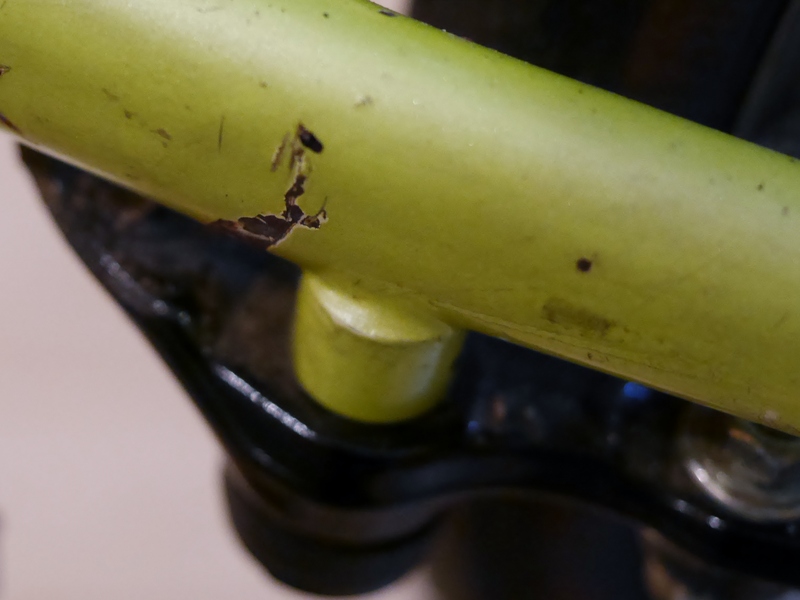 Unfortunately, the seat stay holes have caused a stress riser to appear on this cyclist’s bike. Paul’s chain keeper for my 1×7 drive train, with vintage Peugeot branded crankset. 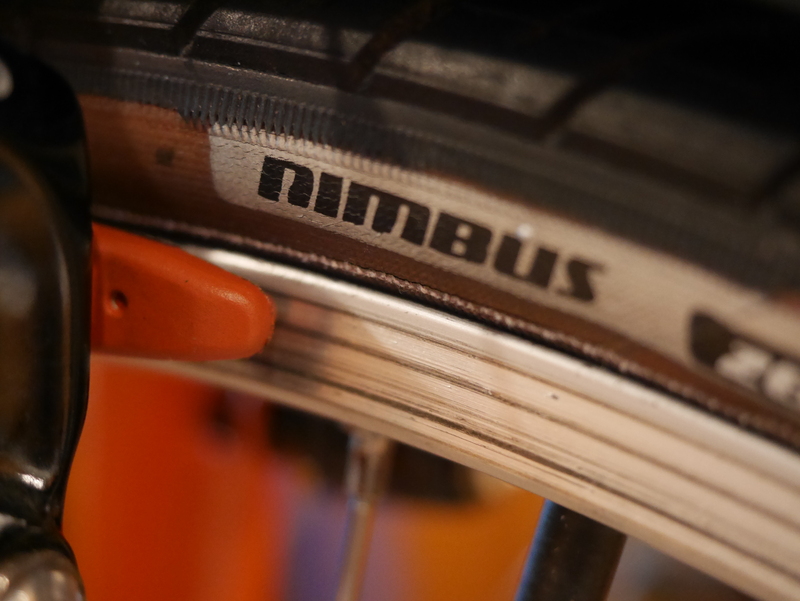 Specialized Nimbus Tires. 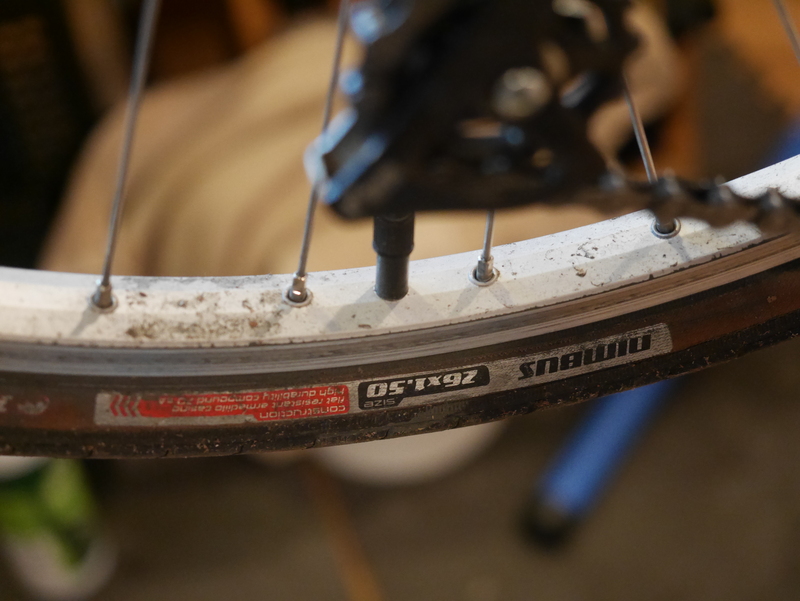 Never a flat in six years, and the exact opposite of supple side walls. After sanding to remove the paint, no stress crack visible. On my own frame, I had concerns about the paint cracks which had developed near to the U-Brake braze-ons on the chain stays. Whenever you heat the tubes to braze, there is a danger of overheating and weakening them. 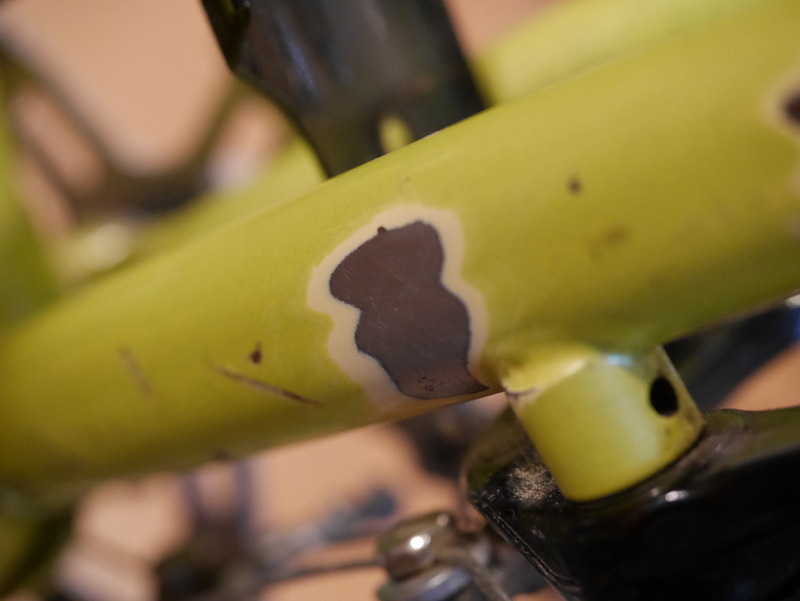 Since the frame was already cosmetically challenged, I had no qualms about taking my emery cloth and sandpaper to this area to see what lay beneath the cracked paint. Fortunately, nothing at all. But now I can monitor this area. I will paint it with Testor’s clear paint so that I can watch for any future changes. SunRims on the wheelset I built for this bike – holding up okay but the sidewalls have been scored by my too hard brake pads. 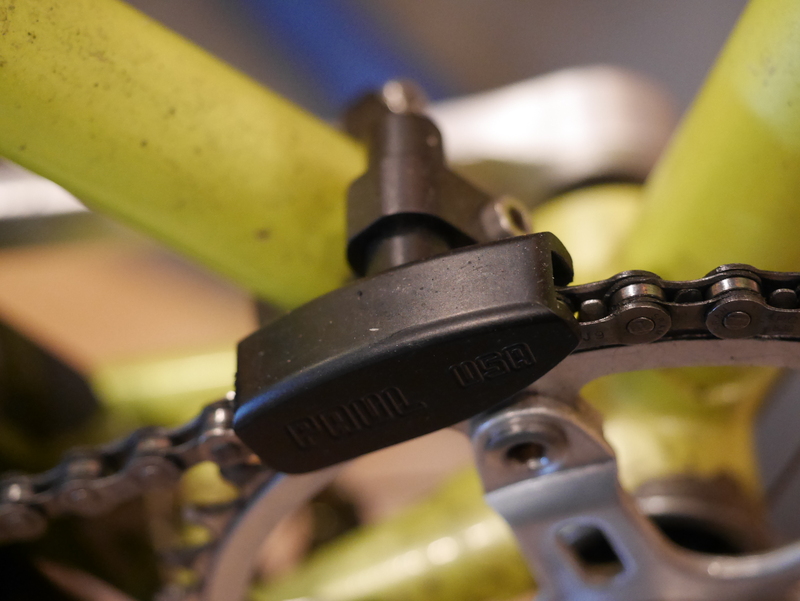 Offending hard pad on the U Brake – showing no wear which is a bad sign. Meaning that my rims have suffered instead. Repair job on the broken fender attachment. While I had the bike in the shop stand, I decided to do a full tune-up. I washed the wheels (a new wheelset which I built last year, and which are working well), picked rim material out of the brake pads, sanded the rear ones, replaced the too hard original Tektro pads which had messed up my new rims, and cleaned and lubricated the SunTour freewheel (more on that, below). 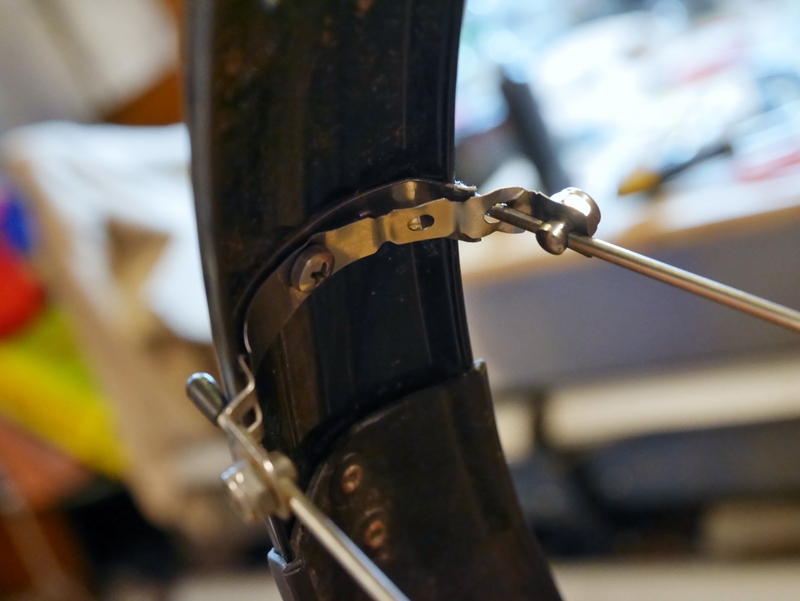 I repaired the broken fender attachment by rummaging through the parts bin to find a reasonable facsimile with which to repair the broken bracket. I drilled a new hole through the center of the fender, and installed the new bracket. Hopefully, it will survive and thrive. 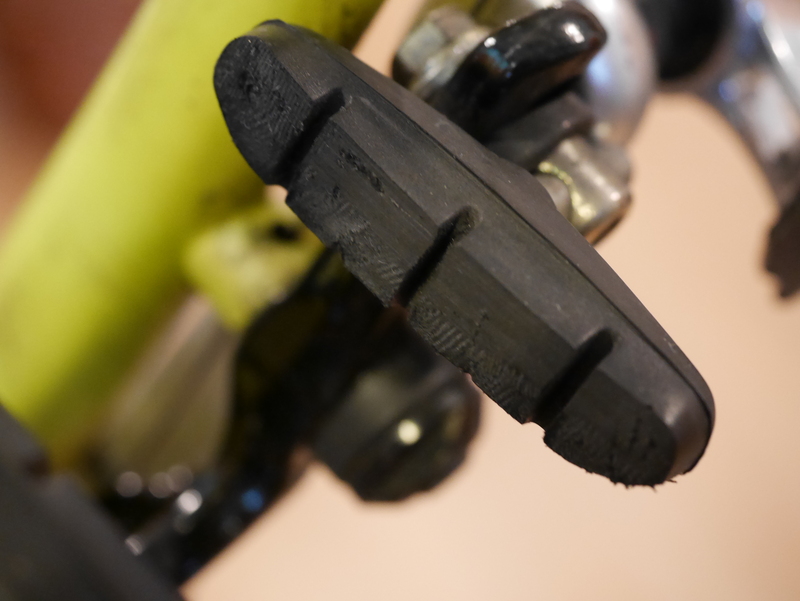 New front Kool Stop pads – replacing the original Tektros which badly scored my new rims. But now, to my chagrin, my newly cleaned and lubricated 7 speed Suntour freewheel is making very odd grinding and clunking sounds. 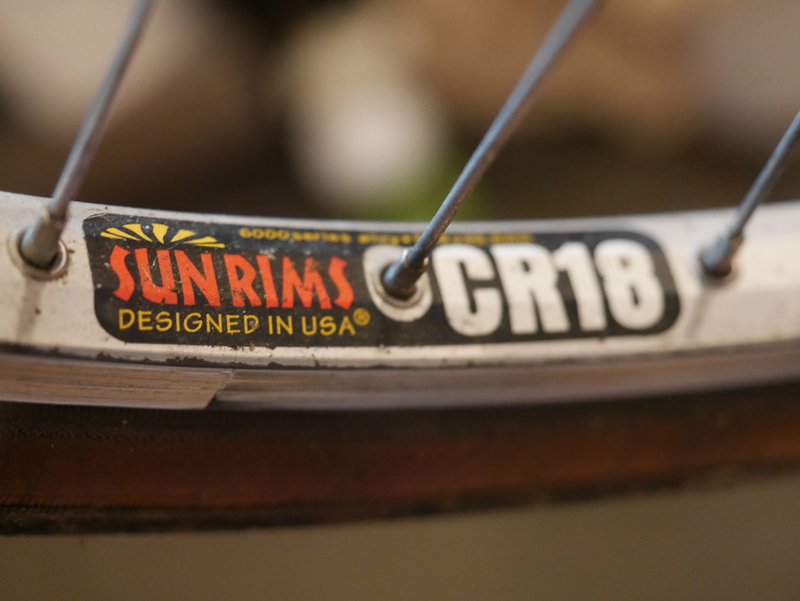 I have always loved Suntour freewheels, and have never had one fail on me. After doing some research, Sheldon Brown (RIP) came to the rescue. He described a situation similar to mine, where my newly lubricated freewheel began sounding clunky under load, and noisy while freewheeling. I believe the problem may be a loose cover plate. Meanwhile, I have a fun old Atom 5 speed freewheel from the 1970’s with English threads which I am going to install while I troubleshoot the beloved Suntour. The higher geared old Atom freewheel should make me ride even more slowly. But, as I said before, it’s not me, it’s the bike. 28 lb machine ready to hit the road. This entry was posted in Bicycle commuting, bicycle frame geometry, Bicycle restoration, Commuter bicycle, Panasonic Bicycles, town bike, townie bike, wheel building and tagged bicycle restoration, fender repair, Mountain bike, Panasonic bicycle, Panasonic MC 7500, Suntour freewheel, Tange tubing by Nola Wilken. Bookmark the permalink.